For over 45 years, Niagara Helicopters has been thrilling passengers from all over the world with the highest, longest, most scenic, and most exciting helicopter sightseeing experience in the Niagara Region! We review our tour and attraction members for quality, content and value. We believe that our website represents the best tours and attractions in the country. On TrustedTours.com you'll also find important visitor information, things to do and recommendations in our "City Info" sections. 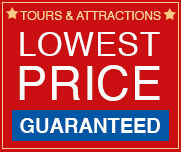 Buy your tour, attraction and museum tickets online at discounted prices and know that you're dealing with the best!